Being without heat during one of our Northern Anne Arundel cold snaps may send you straight to the phone to call a furnace repair service. Before you call, there are a few things you can check to either avoid repairs or be prepared for them. Brumwell’s Instant Heating & Air Conditioning has answered plenty of house calls that weren’t really necessary. Truly, it was just something simple such as the thermostat not being switched over to heat. We want to help our customers and others by suggesting the following 5 checks that you can do yourself before you call for furnace repairs. Make sure the thermostat setting is set to heat and that the fan is set to automatic. Also, make sure that the temperature setting is turned up to a higher temperature than what it is outdoors. Replace the battery if necessary. Even gas furnaces use electronic ignition devices to turn on. Hopefully, you can avoid furnace repair service. Check the main breaker box of your home to see if a breaker to the furnace has tripped. If so, make sure the furnace is off and flip the breaker. Turn the furnace back on to see if that was the problem. If you have an outside unit, look near the box (or condenser) for a breaker box. If it has tripped, make sure the furnace is off first and then flip the breaker and turn the furnace back on. The repair technician will need to know what type of furnace you have. We’re not talking about the make and model but more about what type of power it runs on and whether it’s a furnace, heat pump, or boiler. 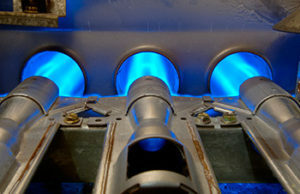 Gas & electric furnaces – A gas or electric furnace can be part of a central air system or a separate unit. A wall furnace can be wide and thin or tall and a couple of feet wide. Wall furnaces just one room. A central air furnace will be located in the HVAC closet. Duct furnaces – Duct furnaces are generally located on the outside of a commercial building and look like big boxes. These units are used with the buildings heating/cooling and make-up air systems. Heat pumps – Take a look at your central air thermostat. If there is a setting for “emergency heat”, you have a heat pump. Not all have this setting so you can also turn on the heat (make sure it is blowing through vents), go outside to the condenser, and check if the fan is turning. Unless the condenser is having a problem, the unit will be running if you have a heat pump. If all else fails, look for a label or google the model number and brand name. Boilers – You probably know if you have a boiler but in case not, look for water pipes connected to the unit that looks like a furnace. If there are, you have a boiler. If you need furnace repairs in Northern Anne Arundel, please call us for a free estimate at 410-360-0002 or complete our online request form.